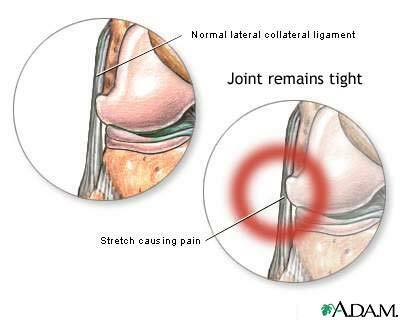 Initial treatment of an LCL injury includes ice to the area, elevation of the joint above the level of the heart, non-steroidal anti-inflammatory drugs (NSAIDs), and limited physical activity until the pain and swelling subside. A hinged knee immobilizer should be used to protect the ligament as it heals. The extent of this type of injury is usually excessive stretching of the ligament causing the pain and tenderness.